Heat a large stockpot or Dutch oven over medium heat. Add bacon and cook until brown and crispy, about 5-6 minutes. Transfer to a paper towel-lined plate and set aside. Melt butter in a large stockpot or Dutch oven over medium heat. Add garlic, onion, carrots, leeks and celery. Cook, stirring occasionally, until tender, about 3-4 minutes. Stir in cauliflower and bay leaf. Cook, stirring occasionally, until barely crisp-tender, about 3 minutes. Whisk in flour until lightly browned, about 1 minute. Gradually whisk in clam juice, reserved clam juice, and milk, and cook, whisking constantly, until thickened, about 3-4 minutes. Bring to a boil; reduce heat and simmer until cauliflower is tender, about 10 minutes. Add the clams and cook for another 5 minutes. Season with salt and pepper to taste. If the chowder is too thick, add milk to thin out. 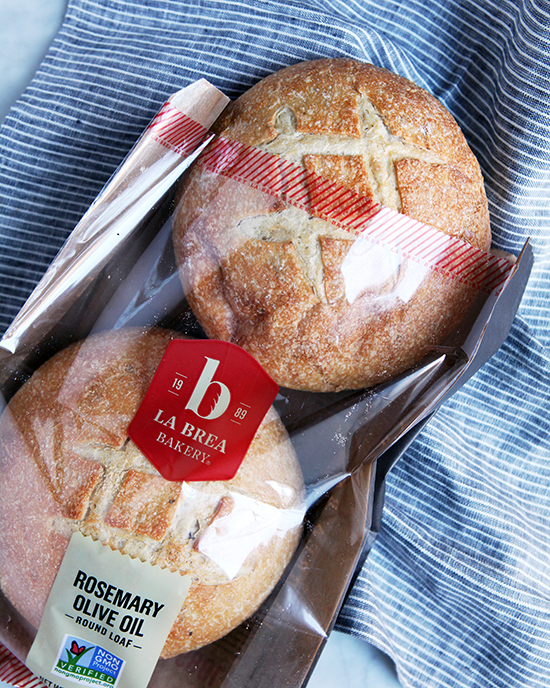 When ready to serve, cut the top off of the La Brea Bakery Rosemary Olive Oil loaves, and remove some of the inside to form a bowl, leaving an inch border around. Ladle hot chowder into the bread bowl. Serve immediately, garnished with bacon and parsley.